It first involves the parts of the brain that control thought, memory and language. People may have trouble remembering things that happened recently or names of people they know. Over time, symptoms get worse. People may not recognize family members or have trouble speaking, reading or writing. They may forget how to brush their teeth or comb their hair. Later on, they may become anxious or aggressive, or wander away from home. Eventually, they need total care. Researchers compared the brains of elderly people who were obese, overweight, and of healthy weight to see if their brains looked equally healthy. They found that obese individuals had brains that looked 16 years older than the brains of people who were at a healthy weight. Obese people also had, on average, 8% less brain tissue. Overweight people had brains that looked 8 years older than the brains of healthy-weighted people and had 4% less tissue. Researchers found that the obese people had lost brain tissue in areas that are critical for planning and memory, attention and decision making functions, long-term memory, and movement. 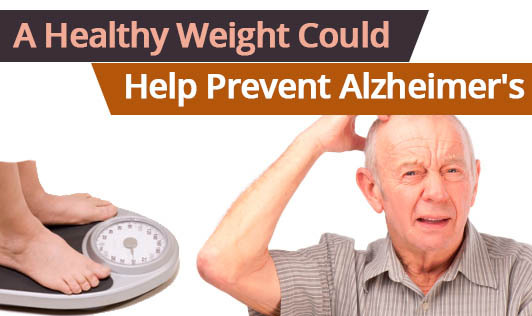 Exercising, eating right, and keeping weight under control can maintain brain health during aging and potentially lower the risk for Alzheimer's and other types of dementia."